Yesterday was a bright, blustery, bewildering day. The leaves are all gone from the trees, but the wind shook the dark branches, and the light came white and strong at such an angle that it was always in your eyes. We walked the boys to school, and in about five minutes I got a call to pick Malcolm up, because he had a headache. An hour later I got a call to pick Isaac up, because he felt like he was in an oven and someone was playing ping pong with his head, and because he felt a little noxious. They spent the rest of the day flying around the house singing. They were fine, mostly. They’d sit down every once in a while and say they felt queasy, but it never lasted for long. I’m perpetually dizzy, myself, so we made quite a trio. It was a strange, nice day, the time passed in odd leaps and it felt like an in-between day…not quite sick, not quite well, not quite dozing, not quite awake. We don’t have too many days home together once school starts, with me gone at work all weekend, so it felt like a needed day. Malcolm and I went to the grocery store, which sounds dull, but is one of my favorite things to do, and one of the things I miss most about summer. He was very quiet, and said he felt a little funny, but he also said he was fine. We talked about what might be worrying him, what might be giving him a headache that sends him home from school. He’s had lots of academic stress lately, and today he’s at sleepaway camp for the first time ever. We talked a little about those things, but mostly we just drove through the slatted white bright sunshine and it felt good to be with him not talking. At the store he asked for a bag of mints, and I said sure, because he’s not feeling well and he was being so thoughtful and kind. It was on the top shelf, and when he brought it back to the cart he said, “You can always reach something if you really want it.” We came home and I was confused about the time of day so I was useless for anything but baking cookies. We made pizzas and packed Malcolm’s bag. This morning I had a brief moment of panic, a sort of lost slipping feeling, that I wasn’t packing Malcolm’s lunch for school, that for two-and-a-half days I wouldn’t be there to make sure he had enough to eat and was warm enough and got everything he needed. But he’ll be alright. If he really wants something, he can always reach it. These are the cookies I made yesterday. Hazelnut and chocolate chip shortbread with black currant jam in the center. 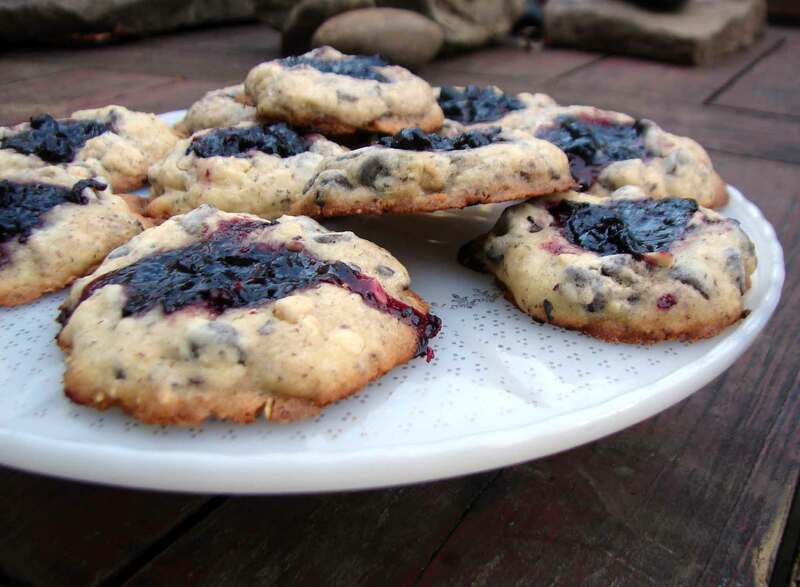 Of course you can use any kid of jam you like, but I recommend black currant, because its tartness sets off the sweetness of the rest of the cookie in a nice way. Here’s Dizzy by Tommy Roe. Preheat the oven to 350 and lightly butter two big baking sheets. In a food processor, whiz the butter till it’s soft and squishy. Add the sugar and whiz again until well-combined. Add the egg and vanilla and process until smooth. Add the flour, salt and hazelnuts and process until the hazelnuts are fairly well broken down, not too well-ground, but not too chunky. (Although you can make it as chunky as you like it.) Add the chocolate chips and process for about half a minute, just to combine them and slightly break them down. Pick up about a teaspoon of batter and roll it into a ball. Place it on the tray, and press down in the middle with your thumb to make a little crater. Repeat with all the dough, leaving an inch or two around each cookie. 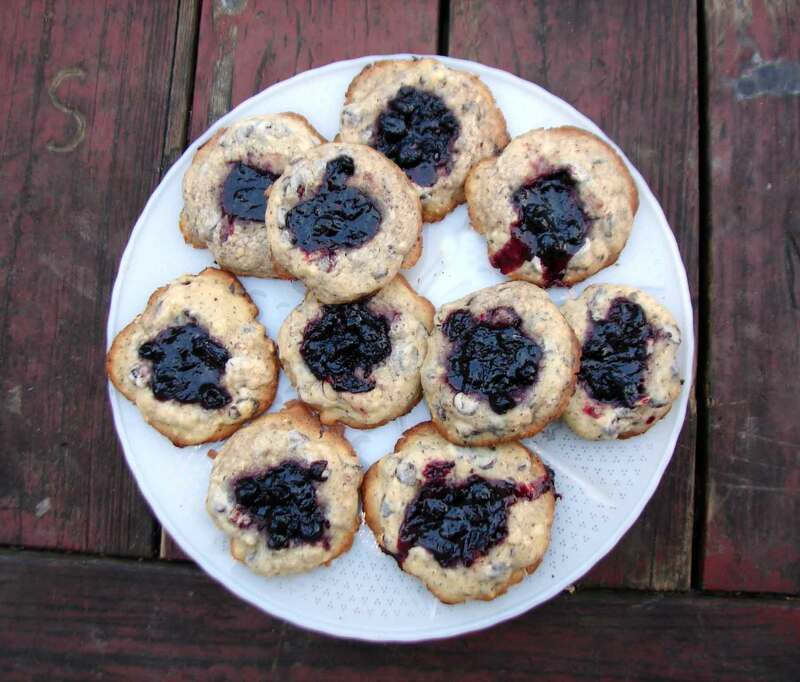 Put a dollop of jam in the center of each cookie. Bake ten to twelve minutes, until they’re golden on the bottom and firm to the touch on the top. Let cool on a rack, or you’ll burn yourself on hot jam! This entry was posted in chocolate, cookie, dessert, recipe, Uncategorized and tagged hazelnut black currant, hazelnut chocolate, jam cookies, shortbread cookies, thumbprint cookies by Claire. Bookmark the permalink.